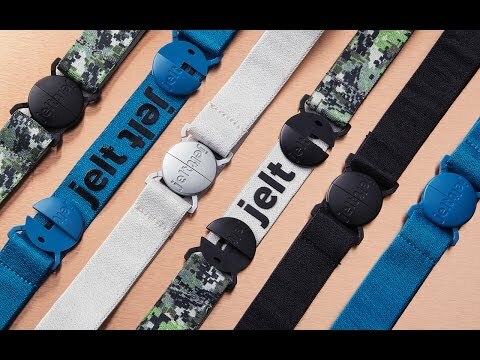 The Jelt is a comfortable, unisex elastic belt. With a low-profile buckle and gel to help it stay in place, it’s a good looking belt that keeps you looking good, too. The Jelt is an elastic, unisex belt with a low-profile belt buckle, made to lie flat while you wear it. It’s a fashionable solution to two problems: Bulging, untucked tops and pants that ride down when you sit or bend. Maker Jen Perry runs a guest ranch in Montana, and found that she often inadvertently revealed her backside while in her favorite skinny jeans. So, she created a new style of flat belt to specifically address this problem—the Jelt. . . or Jen’s belt. It’s a name that has extra meaning, though, because the Jelt uses a grippy gel to give it maximum hold and elasticity. It stays up even when you’re sitting or bending down. Or running a guest ranch. As for the buckle, it’s designed to lie flat, so untucked tops don’t flare out. And since it’s non-metallic, there's no need to take it off at airport security. Plus, the Jelt is made entirely of recycled materials and comes in a variety of retro-influenced styles. So, even though it’s Jen’s belt, really, shouldn’t everyone have one?